Meanwhile, Swami would be out in the veranda, seemingly involved with the afternoon Darshan; but one could clearly see the Mother in Him, anxiously awaiting the return of His dear children. And when He heard their roar, how His face would glow with delight! For their part, the students would just jump out of the trucks without even waiting for them to stop and dash into the Sai Kulwant Hall - wash-up could wait until later! As they rushed in, Swami would walk forward to meet and greet them, plying them with various questions like: "Did you all eat? ", "Are you tired? ", "Where all did you go?". To the poor and destitute villagers He is Compassionate God but to His students, He is the Loving God and Loving Mother combined! Ten days had passed and all the villages mentioned by Baba had been served. It seemed that all that one had to do was now to relax a bit and get ready for the Akhand Bhajan, due to start on Saturday, 11th November, 2000. 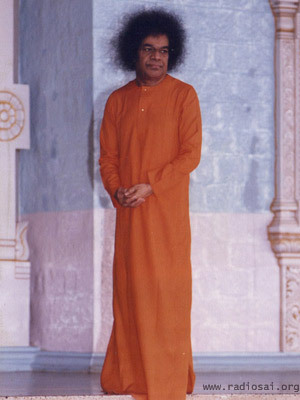 The day prior to that, Swami was out on the veranda in the company of students, and a few of them were asked to speak. It was rather like the Trayee session, but in Kulwant Hall, and in the presence of the entire audience of devotees. At the end of the speech-making, Baba announced that in response to the prayers of devotees from other places, He had decided to include also Penukonda and Dharmavaram. These were not villages but towns, and much bigger than even Puttaparthi! According to official statistics, the population of Penukonda was over forty thousand. Over night, food had to be prepared and fifty thousand packets had to be made. But with Sai, the impossible becomes possible. When Swami came out for Darshan on the morning of the 11th, He told people on the veranda, "Our girls worked all night and have prepared fifty thousand food packets and laddus! All set for Penukonda service!!" With that remark, He gave a gentle nod and the familiar procession got under way. Penukonda is about forty kilometres to the west of Puttaparthi. A few centuries ago, it was one of the places patronised by the kings of the Vijayanagaram Empire. It also has a sizeable Muslim population. On account of its extent and the population, Penukonda posed challenges of its own. However, there was one advantage; being a town, here one could seek the help of the Administration. Needless to say that all the Officials and the Police were most helpful. In fact, they expressed a desire to participate in the service themselves - such was the infection of Swami's Love! Penukonda was a tough assignment in every way. The town was big and long distances had to be covered by the boys distributing food door to door. There were also a large number of shops that had to be visited. Being a trading centre, there is always a large floating population that could not be missed out. And people in the Bus Stand too had to be taken care of. Besides all this, there were two unusual departures from the earlier routine that merit special mention. 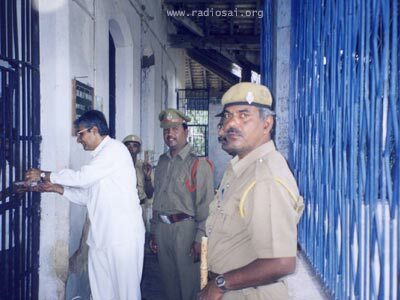 Firstly, taking the permission of the Police, one group visited the local jail and distributed Prasadam to the prisoners! Next, there were a large number of Muslim colonies. Every one of them was visited and Prasadam was distributed. Later, when Mr. Chiranjeevi Rao went on his monitoring rounds, he found a large number of destitute people in one Muslim locality. These people could not go the place where clothes had been distributed earlier. Spotting a Mosque nearby, He promptly located the Mullah there and sought his help in identifying the deserving. About seventy to eighty such people were identified, and preparations were commenced to distribute sweets, food, and clothes to these people. Just then, it started raining. Till this time [and in fact after this too], no rain was ever encountered. Everybody ran to the Mosque nearby to take shelter, and arrangements were made to do the distribution there. 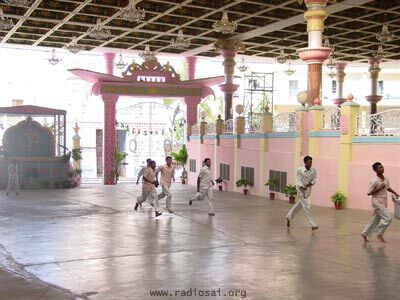 Suddenly, the devotees involved in the distribution recalled Shirdi Baba, who spent all His life in a Mosque. It seemed as if the rain was Divinely ordained to make everyone recall the earlier Avatar of Sai! Understandably, this part of the service was performed with special vigour and enthusiasm, with not only the usual cry of "Sai Ram", but also "Allah Malik" [God is the Master], a favourite saying of Shirdi Baba. After the break provided by the Akhand Bhajan, it was now the town of Dharmavaram, reportedly having a population of over eighty thousand! All that had been done up till now paled into insignificance! But such is Sai's Grace that one more peak was conquered, thanks especially to the wonderful co-operation from both the town officials as well as the local Seva Dal Organisation. For years, these Seva dal volunteers had been silently providing various types of assistance to pilgrims coming to Dharmavaram, en route to Puttaparthi. Now, they had the chance to mingle with those sent by Swami for service in their town. In Dharmavaram too, there was an unusual group that had to be served. For years, this town acted as the outpost for those journeying to Puttaparthi by rail. Passengers had to get alight at Dharmavaram Railway Station, and make their way to Puttaparthi by road [distance of about forty kilometres or so]. Finally, the Ministry of Railways woke up to the needs of Puttaparthi, and sanctioned the construction of a loop railway track from Dharmavaram to Penukonda, via Puttaparthi. This track was getting ready, and people were in fact working furiously to have the line inaugurated before the Seventy-fifth Birthday [it was inaugurated on 22nd November, 2000]. As happens always, many people had to be moved out of their land to make way for the railway track. In India, people who are displaced by dams and railway projects often face hardship. Remembering this, a special effort was made to visit the colony of displaced persons in Dharmavaram, and give them all food and clothing. It was mid-day and the Sun was scorching from above; yet, volunteers trudged up and down to locate all the displaced families - over two hundred of them - and bring them Baba's loving Prasadam. The events of November 2000 are very distinctive and unique, and carry their own subtle message. Many may perhaps wonder: "All this business of going to the villages might sound great; but what is one day of service going to do the perpetual problems of these people?" In a similar vein, many young people argue, "Look, I have this special skill and training. This country does not offer any opportunities for pursuing this line. So, I have to go out." In its own way, these ten days of village service cured most people of such doubts and misgivings. For the first time, thousands of young men and women had an eye-ball to eye-ball confrontation with grim poverty and difficult living conditions. They understood that they are in a privileged position because thousands of others have sacrificed quietly and unnoticed. Swami had told them countless number of times: "After completing your education, do not run away to other countries in search of greener pastures. Stay back and serve your people. You are what you are because of what you have received from your society. You owe it something in return." Thus far, it was just another piece of advice, like many others; it had hardly sunk in. But now it was different. Those words of Bhagavan meant something very important. At one stroke, almost all students of the Institute turned their eyes from far off lands to their own. As one student told his teacher who asked him what he thought about it all, "Sir, this is just a curtain raiser. For me, the 'show' starts when I graduate from the Institute. I have now realised, that life is meant to be spent in service, here, in this country. We owe so much to so many." There are also the nobler and spiritual aspects of service that are often lost sight of. 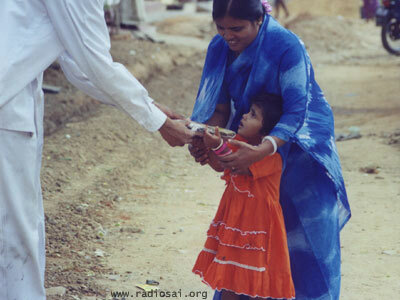 Significantly, Swami never uses the term poor-feeding; instead, whenever food and clothes are distributed, He always refers to it as Narayana Seva, meaning service to the Lord. When one serves the poor, one's vision must not be purely superficial; one must not see a poor person but the Lord Himself, disguised as a poor person! When in addition one realises that the same Lord is also the In-dweller, then service is rendered to the Omnipresent Self - the Self as one particular body serves the Self coming as another body. A few days after it was all over, Baba told the students that this is the spirit in which service really ought to be done. When Swami says LOVE ALL, it really means: "See God in all and Love that Omnipresent God who is also in you." This is the inner meaning of Swami's saying: "I separated Myself from Myself in order to Love Myself!" And when Swami adds, SERVE ALL, it implies that one must serve fellow beings with the feeling that one is really serving the Universal Self who is in us as also in everything else in the Cosmos. In short, the 'Silent Revolution' of November 2000 brought home the lesson that Love and Service are like the two wings of a bird; flight is not possible with just one wing alone. Through the instrumentality of His students and devotees, in those ten days or so, Swami touched thousands of hearts in a thousand different ways, giving new depth and meaning to the familiar adage: LOVE ALL, SERVE ALL.